Mixing fine cinema with fine wine? Why not?! The Alamo Drafthouse, a fine purveyor of quality adult beverages at their many theatrical establishments, has launched a new series of wines they've dubbed the Silence of the Lambs signature wines. Yes it's a bit odd to tie in with a movie theater/distributor, but the best part is they're linking everything together with Mondo poster art and a special screening of the 1991 Best Picture winning serial killer classic. "I ate his liver with some fava beans and a nice chianti." Now you can order some of "that" chianti. See the art for the film and details on the wines (if that's your thing) below. 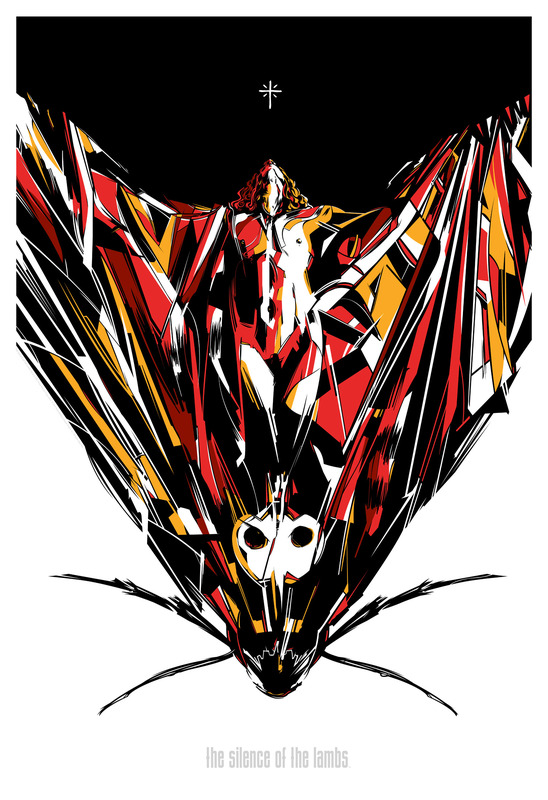 These two prints were created by designer Caesar Moreno and will be screenprinted 24" x 36" by Mondo. Both of the posters go on sale Thursday, May 30th for $40 for anyone interested in grabbing either of them. 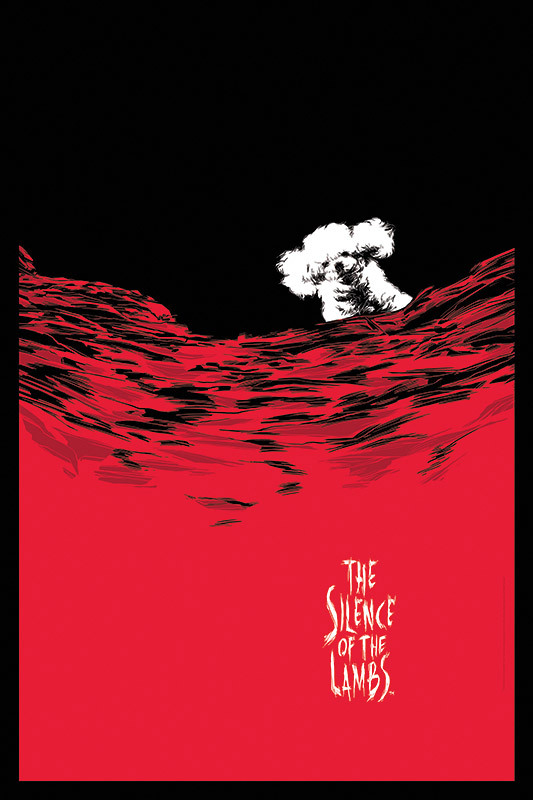 "Suit Yourself Pinot Grigio" and "The Cannibal Chianti" wine will be featured at The Silence of the Lambs Feasts taking place at select Alamo Drafthouse locations nationwide. The four-course menu, created by Drafthouse Austin Market Chef Trish Eichelberger, will feature wine pairings. Visit Drafthouse.com for info. Fine art to go with great wine. 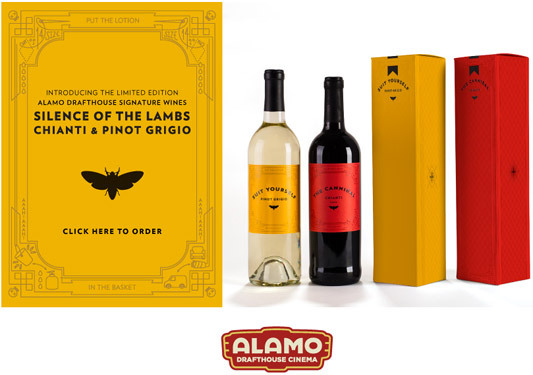 Alamo Drafthouse is delighted to announce the launch of its second limited edition signature wine, inspired by Jonathan Demme's 1991 Oscar-sweeping thriller, The Silence Of The Lambs. After the success of last year's The Princess Bride-inspired "The Bottle Of Wits," the Alamo is now making an oenophilic nod to noted gourmand, wine connoisseur and psychopath Hannibal Lecter for this year's "The Cannibal Chianti," and one to elusive lotion enthusiast Buffalo Bill for the "Suit Yourself Pinot Grigio." Both wines will be available at all Alamo Drafthouse locations and online here. I don't know about everyone else, but I think this is pretty damn cool. I might have to taste a couple bottles of this myself.